Welcome to the most magical pantomime ever told, where poor Snow White is doomed to live UN-happily ever after…with her horrid stepmother the Wicked Queen. 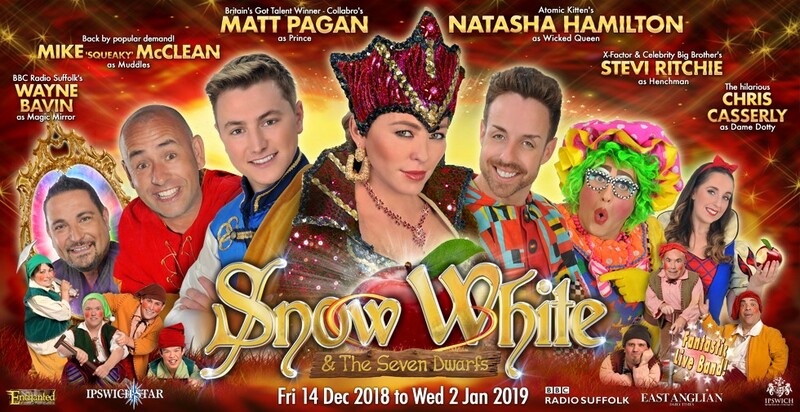 From the same team behind last year’s hilarious production of Jack and the Beanstalk, The Ipswich Regent Theatre have once again teamed up with Enchanted Entertainment to bring you the region’s biggest Christmas show! In a true rags to riches story, Snow White manages, with the help of her ‘madcap’ friend Muddles the jester, to meet a handsome prince and make all her dreams come true. A pantomime full of excitement, including a good fairy, a magic mirror and the craziest seven dwarves you’ve ever seen! So come and join in the festive fun as the Regent Theatre and Enchanted Entertainment bring the world’s best known and most loved pantomime to life. A show bursting with great songs, fantastic dance routines and plenty of laughter, this is a tremendous treat for all the family you won’t want to miss. Hi Ho… Hi Ho… It’s off to panto we go!